Musical Ecologies continues Thursday April 14th with the New York-based experimental new music group Ghost Ensemble. Founded in 2012, Ghost Ensemble draws from a wide range of contemporary and historical performance practices that emphasize the primacy of listening and the pursuit of altered states of consciousness. 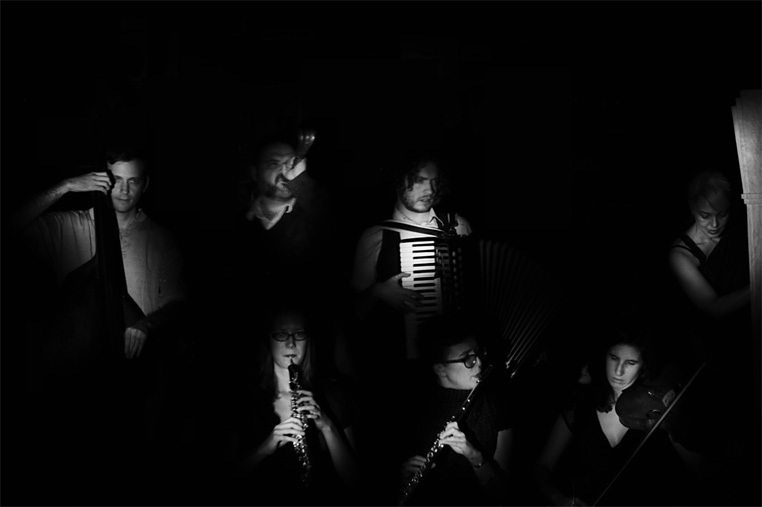 Comprised of regular members Sky Macklay (oboe), Ben Richter (accordion), Lester St. Louis (cello), and Joshua Morris (contrabass), and joined by guest accordionist Lucie Vitkova, the ensemble will perform works by Giacinto Scelsi, Klaus Lang, Marc Sabat, Pauline Oliveros, and Vitkova. The evening will begin with a conversation hosted by series curator Dan Joseph, and a reception will follow. Since 2012, Ghost Ensemble has drawn from diverse contemporary methods to create experimental music that explores the experience of listening. With works and practices ranging from intricate microtonal complexity to intuitive rituals that reach toward unexpected and unexplored sonic locations, the musicians of Ghost Ensemble “use sound to seek an altered consciousness, from a meditative awareness to a look, perhaps, into a different dimension” (George Grella, The New York Classical Review). The group has performed in concert halls, churches, galleries, and chamber music venues across New York City, and explored outdoor soundscapes from the courtyards of Wall Street to the caves at Inwood Hill Park. In 2013 and 2014, Ghost Ensemble inaugurated the release of Pauline Oliveros's Anthology of Text Scores with the composer at Eyebeam and was featured in the East Bank Music Series and Queens New Music Festival; the 2015-2016 season began with a double-header at Pioneer Works in Red Hook with the experimental gamelan group Lightbulb Ensemble. Comments closed — Trackbacks closed RSS 2.0 feed for these comments This entry (permalink) was posted on Friday, March 18, 2016, at 11:30 am by Dan Joseph. Filed in press release.